A much-needed guide that delivers essential baby and child-care advice while reminding parents to calm down and trust themselves. Parents are more overwhelmed than ever before -- juggling demands on their time as well as conflicting advice from family, friends, frenemies and "experts" on how to achieve parental perfection. 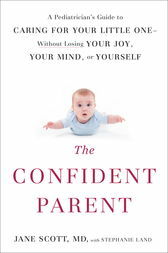 Pediatrician Jane Scott has seen this parental anxiety up close, and in The Confident Parent she shares advice on how to cut through the confusion, dial down the insecurities and unhelpful advice, and simply do what countless parents around the world have done throughout history: respond to their little one's needs without overthinking, overstimulating, and overparenting. * Children are strong and resilient--unless parents teach them not to be. * Picky eating is learned, not innate. * There is such a thing as being too careful. This upbeat and empowering guide shows how small changes can yield big results -- helping both parents and kids feel more secure, confident, and connected. Dr. Jane Scott is a trained pediatrician and neonatologist now working in the private sector, developing medical devices to help infants and children around the world. Before training at Duke University, Dr. Scott lived in England and Ireland, as well as the Australian outback and the South African desert. She has four children of her own, born on three continents, and now is a doting grandparent. Stephanie Land is a writer, book editor, and mother of two who has collaborated on several New York Times bestsellers and ghostwritten for many entrepreneurs, entertainers, and television personalities.